The most beautiful view of the city of Leiden is free. Or actually, it may cost you the price of a cup of coffee, but in return you’ll get that cup of coffee to enjoy. From spring until late autum, a shop called V&D, located in the city center, opens its terrace on the fourth floor and lets everyone enjoy the view. Order that coffee and get one of the (yes, viciously fought for) tables on the balcony and admire the view. V&D is located at the Aalmarkt, in the vicinity of the city hall. Leiden’s public library is situated near the Burcht in the center of the city at Nieuwstraat 4. Buy a cup of coffee and take a book or a magazine outside to enjoy the quiet and the sun. Alternatively, visit the Burcht which is just around the corner of the library, announced by a beatifully wrought gateway with a lion on top. Entering the area of the Burcht is free, but if you want to go to the top there are some steps to climb. Take your own food and book with you, and lay in the grass like many people from Leiden do on a nice summer day. 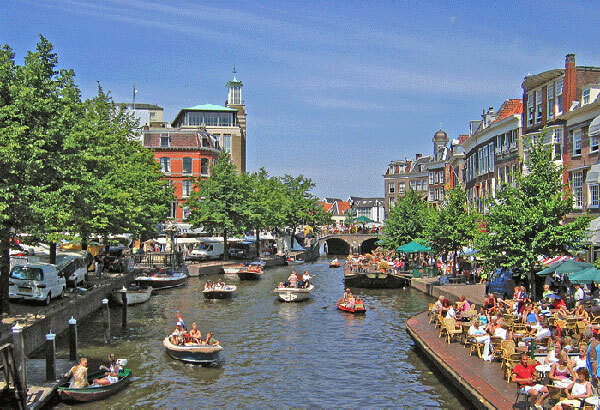 Leiden has many canals that can be explored and admired. If you like a physical challenge, rent a rowing boat or canoe at Botenverhuur ‘t Galgenwater at the street Galgenwater. For people who like to enjoy the sights without too much physical effort but with a decent explanation, there’s a boat tour from Rederij Rembrandt, the boats leave from the Beestenmarkt. Also, a small boat called Schuitjevaart leaves from the steps of the Stille Mare street in summer. The few times I went, the boatman wasn’t very talkative. However, he did show us all the sights of Leiden that can be seen from the water, and there was silence to enjoy the views. Even on the busiest days, the botanical garden, situated at the Rapenburg 73 in Leiden contains most of its tranquility. It may be crowded in the glass houses, but outside you’ll see people sitting near the stream quietly enjoying themselves, or studying. Entrance is not free, unfortunately, but for about 6 euros per visitor you get to enjoy the gardens for a whole day and visit the old observatory. Boerhaave was a famous doctor in the 17th century. He lived in a beautiful castle called Oud Poelgeest about a kilometer north of Leiden (at the time). Now, you can walk around the grounds of this castle at the Poelgeesterweg in Oegstgeest by taking bus 187 towards Oegstgeest, which leaves from the train station, and getting out at busstop Abtspoelweg. A few more meters to the east, and you’ll see the entrance to the castle grounds. Walk back to Leiden via the Leidse hout (a small park) to get some more fresh air and nature. (Fit people may actually easily walk to and from the castle to save some more money). I hope you enjoy your stay in Leiden!